No changes required for 1.1.0.1, simply move the wotmod file to the new 1.1.0.1 version folder. For the big grand release of 1.0.0 I have decided to release two versions of the mod. A basic version, which only removes the fog, and the standard Ultra version that turns off all the unnecessary shinies for a little extra FPS boost. 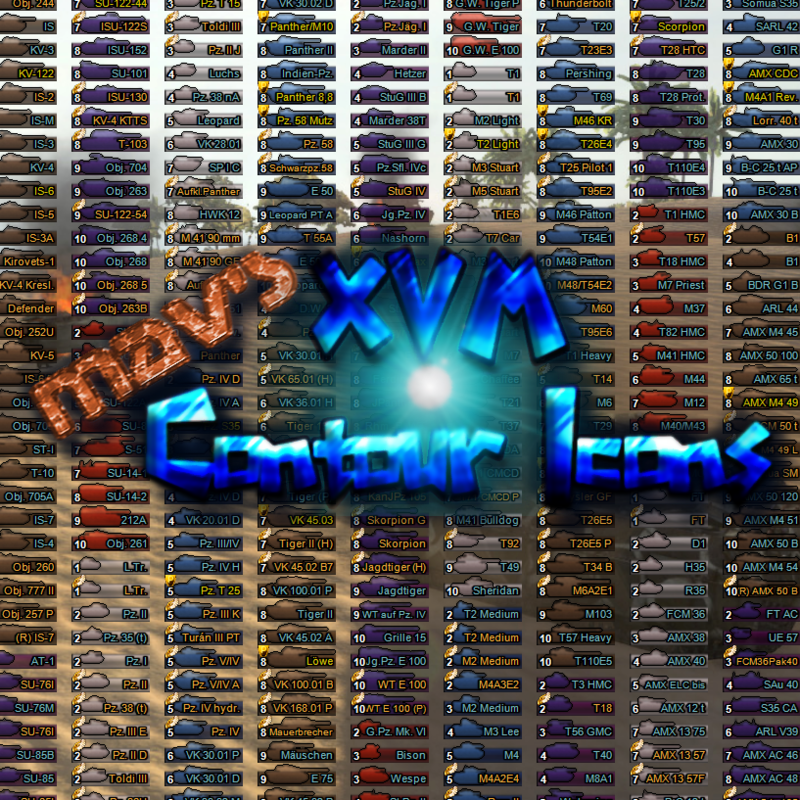 NOW AVAILABLE - Mav's Contour Icons! 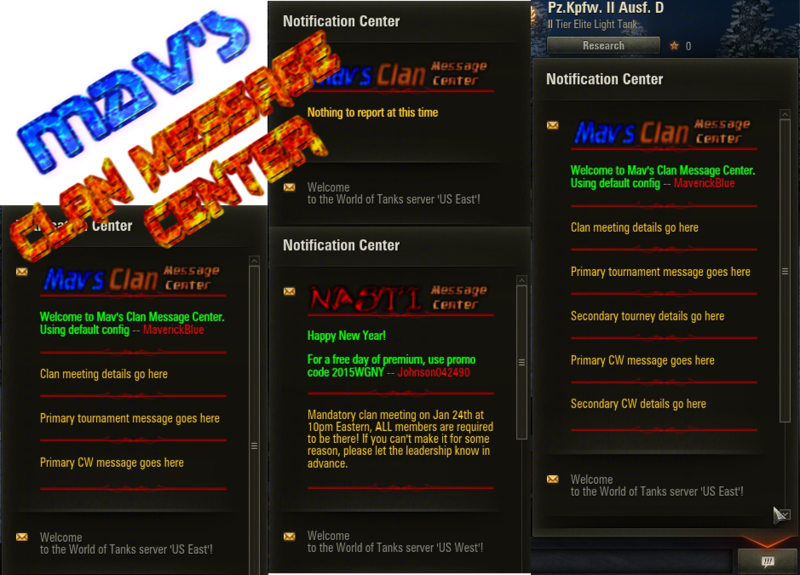 Mav's Clan Message Center - Rereleased for 1.0.0.3 1.1.0! Well WG finally broke it. Unfortunately I haven't had time until now to hunt down and fix which line of code they broke, but I finally did and now it's fixed. Hopefully they won't break it again. However I haven't tested it for compatibility with the various different script loaders used by mods nowadays. It works great with the ones used by the mods in my pack, that may not hold true for them all tho. If you're having issues, try deleting the cameranode.pyc and/or __init__.pyc that I included and using just the one used by your mods. If your script mods locate __init__.pyc in a different folder, try locating the main mod files in that folder instead. Again, I haven't tested this mod against the various different scriptloaders, however these steps have helped me resolve errors between other script mods I use. The 9.14 version of this mod also works in version 9.14.1. I installed it by dropping the mod's "system" folder into res_mods\0.9.14.1\. Before using this mod, my fps would drop from 45 to 10 when I would go into sniper mode. Now the fps only drops from 45 to 35. Great mod for fixing sniper mode framerate issues. Hey mav ive used this in 9.14, and not sure if there are any new maps but it seems the d mapre working, This is Maggz BTW. Will you update this great for the new patch 0.9.12? Thks in advance. Any ETA on the 9.3 version ? I really love this mod makes my stutter issue a thing of the past.. Awesome mod, waiting for next update. I haven't had time to thoroughly test it, but I don't think there should be any problems. If you notice anything, let me know and I'll try to fix it ASAP. how do i install this mod? Just open your World of Tanks folder, open the zip file, and click and drag the 0.9.0 folder from the zip and drop it into your res_mods folder. It should pop up a warning asking if you want to merge with the existing 0.9.0 folder, choose yes. I cant believe that this mod actually improve my FPS! having average fps of 35 sometimes can drop to 20! but after installing this i have now 45 fps ave! thanks man! ur the best!